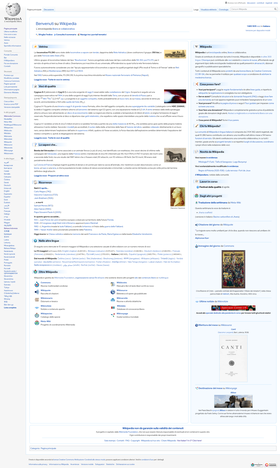 The Italian Wikipaedia (Italian: Wikipedia in italiano) is the Italian-leid edeetion o Wikipaedia. This edeetion wis creatit on Mey 11, 2001 an first editit on Juin 11, 2001. As o 2013 it haes ower 1,446,000 airticles an mair than 1,678,000 registered accoonts. It is the 6t-lairgest Wikipaedia as measurt bi the nummer o airticles (efter the Inglis, Dutch, German, French an Swadish edeetions). ↑ Italian Wikipedia. "Speciale:Statistics". Retrieved 2013-01-22. This page wis last eeditit on 16 October 2013, at 13:06.